"A rather weary one from Vieira...."
In the 109th minute of extra time, Arsenal midfielder Patrick Vieira attempted to spread the play. His poor ball out to the left was picked off by Ryan Giggs. "Giggs gets past Vieira, gets past Dixon..."
Giggs ran straight at the heart of the famous Gunners back line, dodging and weaving his way into the box. The ball seemingly glued to his foot. He burst past tackle after tackle until he fashioned a chance to shoot. "It comes back at him.... It's a wonderful run from Giggs!" His run seemed to have taken him a little too far to the left, presenting him with a difficult angle. But he had come too far and wouldn't be denied. Giggs slammed the ball into the roof of the net past David Seaman and the rest is history. It's seems unfair to summarize the career of a man who played 963 times for Manchester United, and won 34 major trophies, by recalling a goal he scored fifteen years ago. But that fantastic goal at Villa Park, in the 1999 FA Cup Semi Final Replay was his opus. The match, played out between the best two sides in the Premiership at the time was English Football's Ali vs. Frazier, "Thrilla in Manilla" moment. It featured a brilliant opener by David Beckham, a great equalizer by Denis Bergkamp, a sending off for Roy Keane and a 90th minute penalty save by Peter Schmeichel. All this brilliant match needed was a suitable finale and Giggs gave it to us. Besides the importance of the goal that drove United on to an unprecedented treble, it symbolized what United fans saw in the Welsh winger. He was, perhaps unfairly, George Best's heir apparent. A dynamic winger who could take on all comers and score goals. But this goal showed us that he also had Bryan Robson's heart and drive, along with Eric Cantona's intelligence and flair for the dramatic. In scoring this goal Giggs became everything we wanted him to be, from the time he came into the first team as an 18 year old. If you can break down someone's career into a series of moments, this was the moment of his that shines most brightly. He couldn't do this every week. 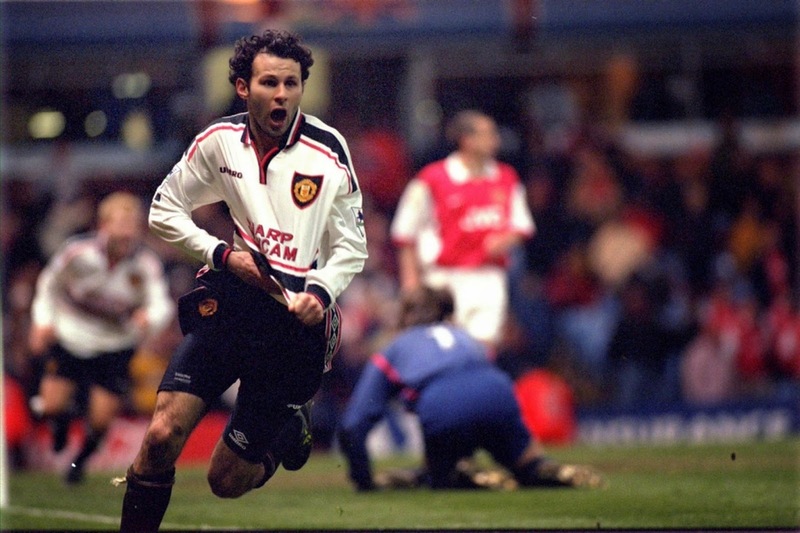 Circumstance such as his early injuries ensured that, but this goal was how many United fans will remember Ryan Giggs. As age, along with wear and tear on his hamstrings slowed down his electrifying early pace, Giggs adapted his game and became perhaps more valuable for his calmness and intelligence on the ball than his runs. Just his presence on the pitch could be enough to steady the ship and get the side back on track. As players came and went at United over the past twenty years, he was the one ever present and his leadership ensured that the clubs terrific success continued. 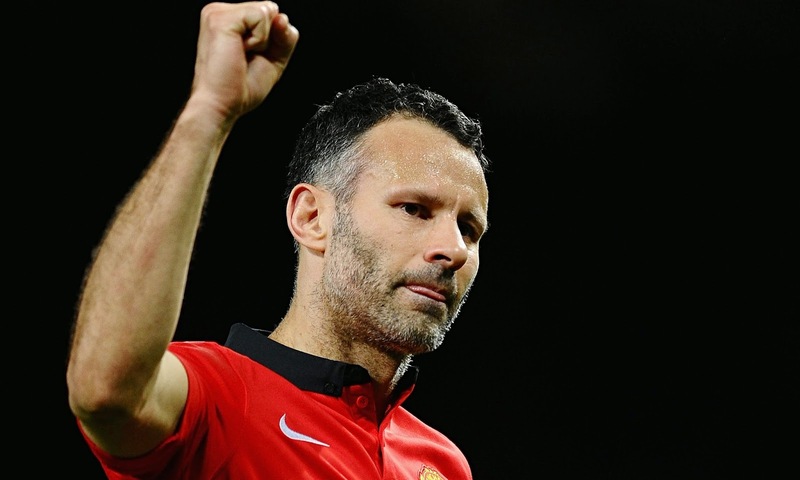 Like his peers in the famous Class of 92, Giggs was ingrained with a winning mentality and his attitude infected many who joined the Old Trafford club. By example he helped set the standards that are expected of anyone who comes to United. It will seem strange to not see Giggs in the number 11 shirt next season, but as he moves into coaching United fans can think back to all of the joy he brought us. Like a title clinching goal against Wigan in 2008, a decisive penalty against Chelsea in the Champions League Final a few days after that, a wonderful goal against Juventus in the fall of 1997 and even an assured performance against Olympiacos at home in this past wretched season that kept United in the competition. But above all many of us will remember a magical night at Villa Park and a Welsh Wizard spinning his shirt over his head after his finest moment.